Oklahoma’s first holistic, long-term, aquifer-based Groundwater Monitoring and Assessment Program (GMAP) was initiated in 2013. Groundwater sampling is conducted on a network of approximately 750 wells on Oklahoma's 21 major aquifers (phased in by 2017 and sampled on a five-year rotation). 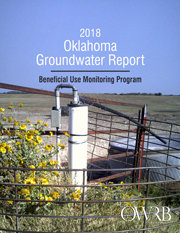 Assessments of Oklahoma’s groundwater will be achieved through both a baseline monitoring network and a long-term (trend) monitoring network within each of the state's major aquifers. This will provide Oklahoma with information on individual aquifer characteristics as well as a more general assessment. Through quality analyses, the natural geochemistry of the aquifers will be assessed to identify concerns. Water samples will be taken from existing groundwater wells and analyzed for parameters such as nutrients, dissolved metals, alkalinity, hardness, dissolved oxygen, pH, and total dissolved solids. A sub-set of wells from the baseline monitoring network will be used for trend monitoring, evaluated multiple times per year. Multiple assessments of water level and chemistry will facilitate recognition of seasonal changes, changes due to climate variability, and/or changes due to usage over time. The differences in these changes as well as aquifer response will be identified in all of the State’s major aquifers. To further facilitate this effort, a select number of wells will be equipped with water level data loggers to monitor changes on the scale of weeks, days, or even hours. Statewide network of 600 wells measured annually by the OWRB and USGS for depth-to-water, providing historical data (1950-present).